Congratulation to the winners of the W.E. Rock Grand Nationals! Primitive camping available onsite, pay for camping with your ticket purchase. No open fires, bring contained firepits; Dogs must be on a leash. Pro drivers should register early and include their $100 mandatory pre-registration. If you don’t show to the event, the $100 will be added to the purse for your class. This is your commitment fee. Pre-registration allows us to plan the event, focus social media profiles on drivers and include you in the pre-event publicity. There will be dinner for teams and families on Saturday at 5 p.m. This will include trophy presentation for Series events. Friday night will be the downtown event again, please plan to attend. The local club is arranging trailers for your vehicles. We will share more information as it gets closer. 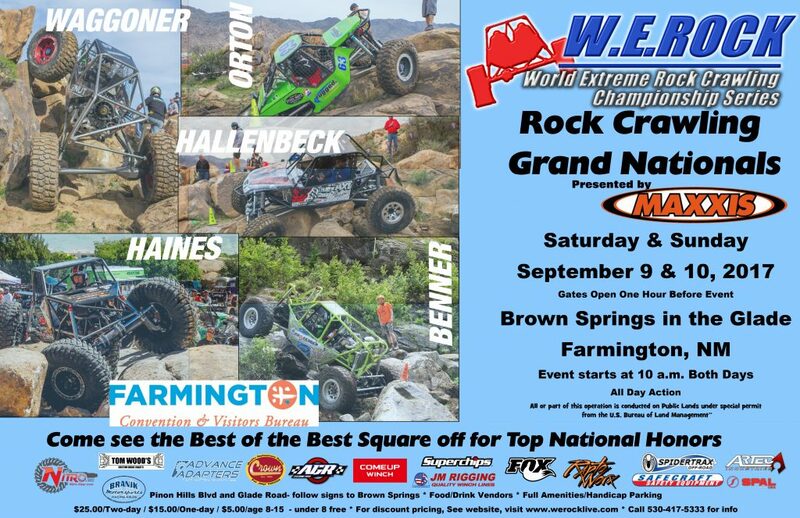 Farmington is an epic rock crawling arena, please share with your fans and friends, all are welcome, even those who have not competed this year. Super spectators, great BLM liaison, lots of help.